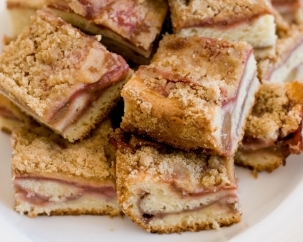 Rhubarb Cake is a delicious combination of sweet and just slightly tangy. This is one of the best cake recipes to make in the spring when fresh rhubarb is ripe and plentiful. Cream sugar and shortening together. Add egg and mix. Add baking soda, milk and vanilla. Mix in the flour, then fold in fruit. Pour into a 9" square baking pan and spread evenly in the pan. Mix together the 1/3 cup sugar and 1 teaspoon cinnamon. Sprinkle on the top of the cake. Bake for 50 - 60 minutes or until a toothpick inserted into the dough portion of the cake comes out clean (the fruit may still be moist). For a simple apple cake recipe, replace the rhubarb with the same amount of finely chopped apples. For an easy pear cake, just replace the rhubarb with a similar amount of chopped ripe pears. Try changing the taste a bit by using ground ginger instead of cinnamon. Instead of mixing the fruit right in, you can pour 1/2 the batter into the prepared pan, then layer the fruit, then the other 1/2 of the batter. 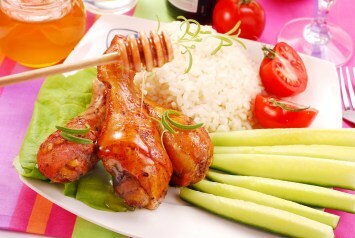 Make it even healthier by replacing 1/2 or all of the flour in the recipe with whole wheat flour. I always recommend sifting whole wheat flour when you use it for baking as it takes out some of the heavier bran and leaves the baking a lighter. Up the nutritional level even more by adding 2/3 or 1 cup of chopped nuts. Chopped walnuts, almonds or pecans would all work well. If you have too much rhubarb in your garden, make several batches of this delightful cake and freeze them. You will appreciate it later. You will find variations below to easily switch this recipe into a tasty apple cake or pear cake, which really makes this an all season, easy to make treat. Any way you make it rhubarb cake is sure to be a real hit with your family. For more dessert recipes as easy and tasty as our rhubarb cake, look here. Love this recipe and funny because I just made it today. When I married my husband 48 years ago, my Mother-In-Law gave me this recipe. The only difference being white sugar instead of brown sugar in the cake. I am going to try it with the brown sugar next time. Also, serve warm with whipped cream.